Half of the world is ailing nowadays with hair loss and greying and there is no such compatible technique in the modern medicine to cure it completely. The premature graying of hair can be attributed to Pitta Imbalance in the hair as well as less intake of copper-rich foods. Ayurveda, on the other hand, might have the ingredients required to curb the problem if applied on a consistent basis. If we look from its point of view, the hair growth has been linked to the physical and mental health and loss of hair is directly the result of a depression, pessimism and being in lively. What is the basic reason for Hair loss and graying? As per Ayurveda, the basic reason for shedding and graying of hair indicate a dosha imbalance as well as a disequilibrium in the activities of the mind. Hair is a by-product of bone formation and the tissue responsible for building bones can also be attributed to the growth of the hair. The loss of hair earlier is related to the body type and the constitution of the body. Hair loss is referred to as ‘khalitya’ in Ayurveda and premature graying of hair is called as ‘Palitya’. Both these are considered pure ‘Paitik Disorder’ or the hereditary problem coming from parents and especially father as well as the features of the body. 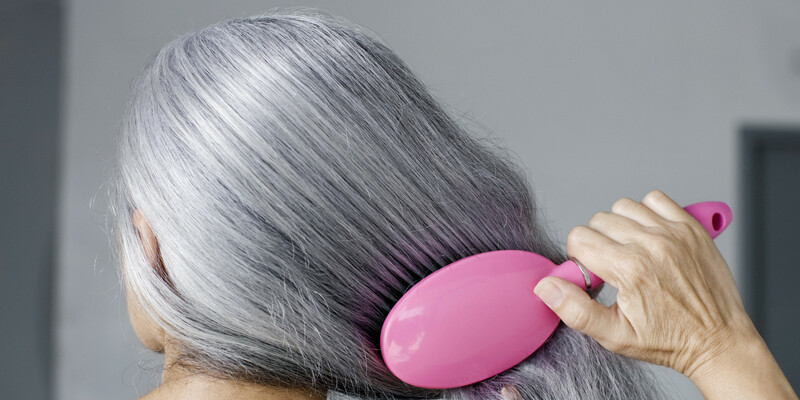 So, when the body features constantly tampers, it can gray your hair. According to Ayurveda, if you consume pitta-enhancing substances, your pitta aggravates and causes gray hair. People with excessive Pitta or anger have a tendency to lose the hair earlier or prematurely. Excess pitta in the sebaceous gland, at the root of the hair, or folliculitis can also lead to hair loss. The increased intake of fried, sour, spicy, salty and fermented foods, as well as tea and coffee, can also increase the pitta dosha in the body thereby graying the hair and you start to lose it rapidly. Apart from the natural shedding and graying of hair, the symptoms of Pitta dosha also include acidity in the stomach, Nausea, excessive sweating and Intolerance to heat. When the body starts to have more of these symptoms frequently, you should understand that there is a requirement of Ayurvedic treatment to the hair. How can you prevent such loss with Ayurveda? This is one of the most common of the practices in Ayurveda for the treatment of hair fall and graying. Panchkarma Therapy such as Virechana, Nasya and Shirodhara can be very helpful in the treatment of gray hair. Virechana helps in balancing the vitiated pitta dosha. While the oil used for Nasya are Shadbindu, neem or Yashtimadhu, Shirodhara can be done with Bhringaraaja oil or neeli oil for the treatment. A regular hair massage with the til oil, prepared with amla, neem, and Yashtimadhu or Licorice can help prevent the hair loss as well as the graying. Hair loss and growth is directly connected with our food habits as proven by Ayurveda. In the recent times, the food habits of men have consistently changed while delving into complete fast food. You must avoid spicy, heavy and oily foods as well as tea and coffee if you want to have a good hair. You must also avoid refined food, sugar, junk food as well as alcoholic and carbonated drinks for better usage. Increase the consumption of fresh fruits, green leafy vegetable juice prepared from lettuce, carrot, capsicum, and alfalfa. Copper-rich products should also be included in the diet to make the hair stronger. Hair is one of the most important parts of the body and its care must be given the due importance always. There are certain tips you must keep in mind to take care of your hair. Let the hair dry completely before applying any oil. Minimum use of hair dryer or activated gel is done to safeguard the hair from loss. Brushes should be of superior quality and must not be of local one where the bristles damage the roots of the hair. Both the brain and scalp prefer to be kept cool, so whenever washing the hair, it is best to use lukewarm water and a cool water rinse.